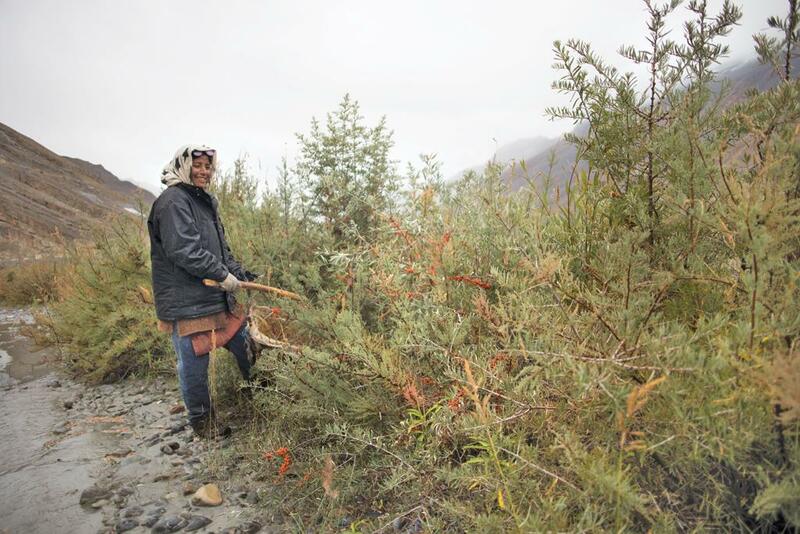 In the past two decades, seabuckthorn collection has increased 20 times in the valley. Can a pan-Indian market unleash the full potential of this fruit? For about a month every year, women in Spiti get a taste of independence. We have a supplementary income that is ours to save or spend as we wish,” says Tshering Dhoton, a resident of Rangrik village near the town of Kaza in Himachal Pradesh’s remote Lahaul-Spiti district, bent over a bucket of freshly-collected berries. The bright orange berries are of the common seabuckthorn, a shrub that grows wild on the banks of the Spiti river. In the past decade, the fruit has emerged as an important source of additional income in the cold desert regions of the Spiti Valley and Ladakh during the harvest months of September and October. While Himalayan faith healers have been using the intensely-sour berries for ages, the fruit came into global spotlight in the early 1990s when its chemical composition was identified. After this, research over the next two decades highlighted the plant’s medicinal potential. “This fruit has vitamins, minerals, fatty acids and anti-oxidants. It has been hailed as a cure for diabetes, high-blood pressure, which are two of India’s biggest killers besides many nutrition-related problems,” says Virendra Singh, a professor at Palampur’s H S K Agricultural University and secretary of the National Seabuckthorn Association, who has studied the shrub for more than two decades. Down To Earth had reported previously on how seabuckthorn’s leaves, too, are therapeutic (see ‘Sea buckthorn leaves can cure liver ailments’, 16-30 June, 2008). A turning point for the berry in India was in the early 2000s when the Defence Research and Development Organisation developed and popularised technology to make sea- buckthorn juice. The juice held around 7 per cent of the beverage market share at its peak in the mid-2000s. Today, that has reduced to 5 per cent. Other seabuckthorn products are yet to hit the market shelves in a big way despite the potential of the shrub and its parts, especially the fruit. There is, however, a clear divide between the popularity of the fruit in the Spiti Valley and the rest of India. In Spiti, a popular summer tourist spot, there is now an active hospitality industry in towns like Kaza. A big hit among tourists is the local produce, informs Karan Singh Bedi, a hotelier in Kaza. “Sea- buckthorn products are a best-seller. They just fly off the shelves,” he says. The demand has led to a windfall for local collectors and procurers. “In 20 years, collections have increased nearly 30 times and collectors are being paid four-five times of what they used to be. Today, even dried leaves fetch close to Rs 300/kg,” says Singh. Dhoton is one of 70 Rangrik women engaged in the collection and sale of the berries. “We have been collecting the berries for close to 15 years now. The berries are collected during the day and sent to the pulping factory in the village where they get pressed at night,” says Tsamtan Dolma, one of Dhoton’s fellow collectors. The women have set a daily limit of 20 kg which they get pulped and sell to Kaza-based Spiti Sea-buckthorn Society for Rs 63/kg. “Earlier, we used to get about Rs 55/kg. Now, even the seeds are being procured. Although the work is painstaking, it gives us an additional earning of around Rs 8,000,” says Dhoton. Bedi says, “I started procuring and processing the fruit back in 2014 when I procured 100 kg from women of nearby villages. This year, the plans are for about 500 kg, which will then be converted into squashes, teas and jams. I use only hand blenders to pulp the fruit and I can get about 6-7 litres of concentrate for every 10 kg of berries. The margins on these products are as high as 500 per cent even after paying more than the average for the fruit. Maybe if I can scale up, we can even explore some kind of profit-sharing mechanism.” He plans to extract and sell the seeds’ oil next. 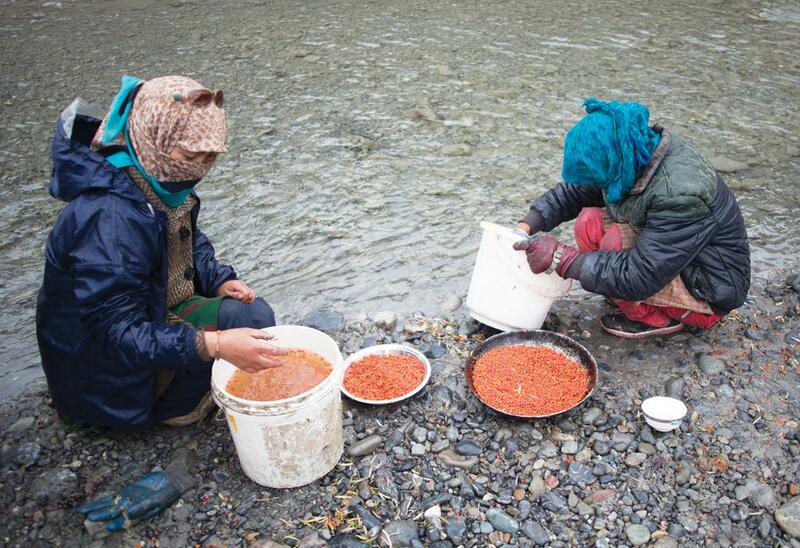 Bedi relies on a local woman from Mane Yogma village, Lobsang Thom, to procure and process berries. 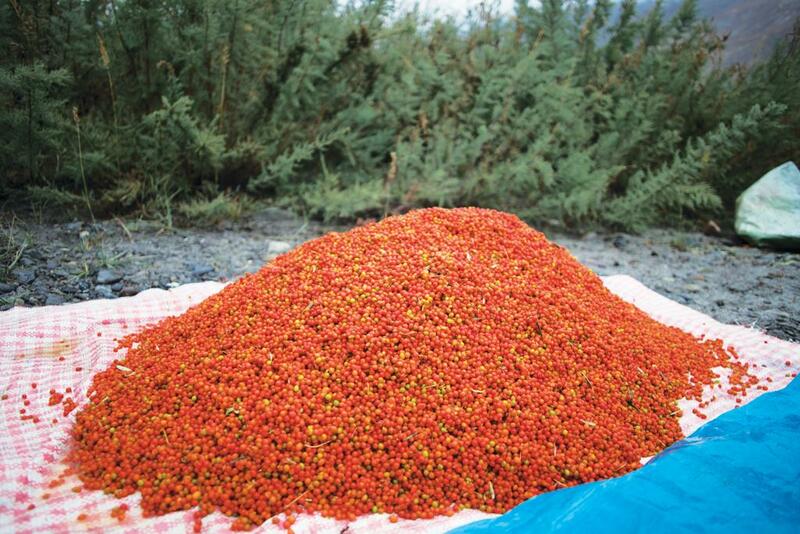 “Seabuckthorn holds tremendous potential for the region. But currently, most sales happen in retail in Kaza and other Himachal cities. The connections with big markets in other Indian cities are non-existent,” Thom says. Traders in other parts of the country affirm that the shrub is yet to carve its market. “There has been an attempt to commercially exploit seabuckthorn. But so far only health-conscious people have shown interest. It has not attained the popularity of other plant-based products like aloe vera,” says Ravi Tibrewal, a Delhi-based trader who has been dealing in seabuckthorn products since 2008. The reasons behind seabuckthorn’s lack of popularity in other states are unclear. Rahul Gupta, an Agra-based trader of natural products, blames inconsistent supply. 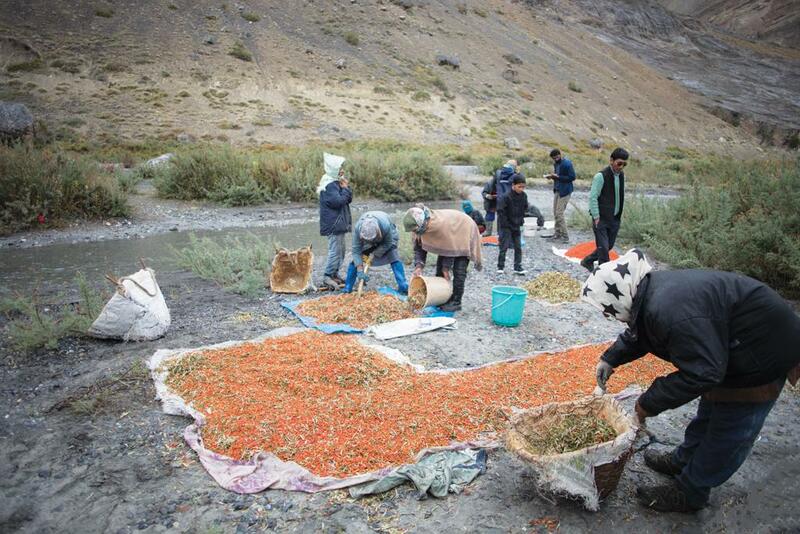 “Dried berries and leaves are procured from Ladakh and Lahaul-Spiti as per demand. But we have not been able to move beyond 4-5 tonnes a year since the berries’ availability is intermittent and unpredictable,” he says. According to Singh, the first step to change this scenario would be to utilise the wild fruit in its entirety and reduce its wastage. “Seabuckthorn grows wild on around 17,000 hectares (ha) across the Indian Himalayas. Of the estimated 22,000 tonnes that grow, we utilise just about 550 tonnes, most of which come from Ladakh. Less than 20 tonnes of Lahaul-Spiti produce enter the market,” he says. The other issue is government support. In 2010, the Congress-led Union government had announced plans to increase the area under seabuckthorn cultivation in India to 50,000 ha by 2020 under a National Mission on Seabuckthorn. “Despite the approval of a basic plan for forming a Rs 1,000 crore project, the mission has now been disbanded. Not a single rupee from the Centre has transpired,” says Singh. (This article was first published in December 16-31 issue of Down To Earth under the headline 'Waste of potential').